The UK Atomic Energy Authority’s pursuit of commercial fusion is an “example of the vision the UK needs to pursue” to see through the Government’s commitment to spend 2.4 per cent of GDP on science and research, according to new Minister of State for Universities, Science, Research and Innovation Chris Skidmore. Mr Skidmore visited the UK’s new fusion experiment MAST Upgrade and the European research device JET at Culham Science Centre today, in addition to delivering a keynote speech on science policy at UKAEA’s RACE robotics facility. During his visit he also met apprentices and staff from Culham’s new Oxfordshire Advanced Skills apprentice training centre. “Places like these are providing the skills our country needs for the future - they are training both the next generation of nuclear researchers and apprentices for businesses across Oxfordshire and beyond,” he commented. Ian Chapman, UKAEA’s CEO, said: “We were delighted the Minister chose UKAEA as the place to outline the Government’s commitment to science. 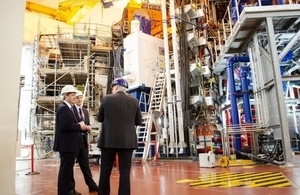 The Minister also visited Reaction Engines, one of the thriving technology businesses on the Culham Science Centre site that are helping to cement Oxfordshire’s international reputation for science and innovation.